Greek-born Dimitris Legakis has lived and worked in Wales for 17 years and considers the UK his home. But since he was hurt in a racially motivated attack last year, he fears for the safety of his family.He spoke to BBC Wales after South Wales Police said hate crime was still drastically under-reported.It follows official figures released in October showing the number of hate crimes across England and Wales rose by 29% in 2016-17.A Home Office report said the biggest rise was in disability and transgender hate crimes, but said the increase was mainly due to better crime recording.South Wales Police said it was "more important than ever" that communities reported issues. Mr Legakis explained what happened to him. Dimitris Legakis is a familiar face to the fans and the players at Swansea City Football Club.As their official photographer he is a regular on the touchline at the Premier League team's home and away matches. His photographs regularly feature in the pages of the national newspapers and, trusted by the players and management, he travels with the team to matches.Last December he was with the team for their away trip to Middlesbrough for the Swans' match at the Riverside Stadium. The night before the match when he was in the city centre he saw a man smash a car window.Mr Legakis, 41, called 999. The man heard his Greek accent and turned on him calling him a "smelly foreigner". Mr Legakis was able to photograph the man before he launched a vicious attack which he also recorded on his mobile phone. "I ended up with two broken arms, my right forearm, the left one a little bone called the scaphoid which hasn't healed yet," Mr Legakis said. "I couldn't work for two months - I calculated it was over During the five-minute call to police Mr Legakis can be heard screaming for help as his attacker Daniel Skelton kicked and punched him to the ground.As well as broken bones, Mr Legakis suffered facial injuries, cuts, serious bruising and was left traumatised by the attack. His camera kit was also badly damaged. Skelton, 29, from Redcar, North Yorkshire, was jailed for 28 months in June after admitting racially aggravated grievous bodily harm, two charges of racially aggravated damage and damaging property, at Teesside Crown Court. 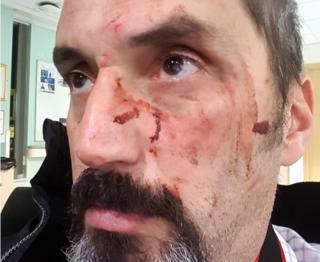 The judge described it as a "sustained and vicious attack".In a letter to Mr Legakis after the assault, Skelton apologised for his actions.He wrote: "I am truly sorry. I had no right to touch you or your belongings - I was in a very bad place. "If I could take it back I would. I hate myself for my actions that night. "Mr Legakis said: "He said he had separated from his girlfriend and he was trying to have a few drinks to forget about it." A year on, Mr Legakis said it had changed the way he thinks and feels about other people. "I'm a bit more concerned, I've always been very open to people, very friendly, I want to believe I am at least, and it's knocked me down a bit in that people may make a comment or say or do something just because of a foreign accent," he said.Following the attack and since a reported spike in the number of recorded hate crimes after the Brexit vote, Mr Legakis said he was concerned not just for his safety but for that of his family. "They do carry a foreign surname with them which at some point may cause some problems for them," he said. » Reality Check: Is crime up or down?